The simplest yet one of the most fashionable pair of apparels that can be worn in our daily lives have to be the denim jeans. It has been 138 years and jeans are still a must buy for almost every young person. A pair of jeans has been an integral part of the revolution of fashion for a lot of designers around the world. Even though they are referred to as clothes for the more 'western' part of the world, they have their fair share of fans in Bangladesh too. A pair of trousers t hat is simple, comfortable to wear, and has a very long durability -- who wouldn't buy something so great? And the best part about it is that it goes with almost anything, starting from sports wear, formals, casuals and even 'panjabis' and 'kurtas'. Not only can you pull a pair of jeans off with anything, it also looks and feels great at the same time. For young people and students facing the winter in Bangladesh, jeans are a great way of staying warm and trendy side by side. The best place to get a pair of affordable jeans would always be the Doja Market, right in front of Dhaka College; you get almost all types over there. Slim fit to regular fit and even baggies which are not that popular anymore but nonetheless, all can be found in Doja if searched properly for students and young boys and girls. There are no fixed prices there, the more you can bargain the lower the prices usually come to. Usually jeans are available between Tk 300 to a maximum of Tk 1000. If you are a fan of faded jeans, again Doja can be a great option. And the prices are almost the same depending on how you bargain. Since it is winter, the best way to pull of jeans would be a normal t-shirt with an over coat or just a plain 'shawl' if you want the more cultural look. Anything warm over the jeans would look great and keep you comfortable against the harsh winter wind. Banga Bazaar is another great option for an array of choices when it comes to jeans in affordable prices, especially if bargained correctly. If you are into the more classic or branded denim jeans, than Bashundhara City can always be a great place to shop. The prices are a bit higher than the stores mentioned above but the effort of searching for the perfect jeans is reduced. Another great place to buy good pairs of jeans would be 'Artisan'. They have a lot of varieties of jeans and one can also buy tee shirts to mix and match with jeans. You get the whole package in one store-- not a bad deal for a shopaholic. The price ranges are not as low as they are in Doja or in Banga Bazaar, but are reasonable keeping the quality in mind. The range of price would be around Tk 700-800 for the trousers and Tk 150-400 for the tee shirts. The beauty of jeans is that they are good for all seasons and all occasions. For young people and students, there will hardly be one or two who do not have a pair of the classic denim jeans in their wardrobe for rough or casual use. The piece of clothing that you can turn to during both your worst and best days and can rely on to never let you down, the pair of jeans is something that you can never have enough of! 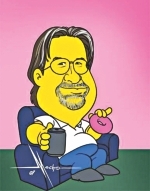 Famous cartoonist, mostly known for his work in 'The Simpsons', 'Futurama', 'Life in Hell' and 'Bongo Comics', Matt Groening was born on February 15, 1954 in Portland, Oregan being the middle of five children. His mother, Margaret Ruth, was once a teacher, and his father, Homer Philip Groening, was a filmmaker, advertiser, writer and cartoonist. His inspiration of the names for the characters in 'The Simpsons' had actually come from his family members despite the fact that 'The Simpsons' were nothing like his actual family. Groening grew up in Portland, and attended Ainsworth Elementary School and Lincoln High School after which he attended The Evergreen State College in Olympia, Washington, a liberal arts school that he described as "a hippie college, with no grades or required classes that drew every 'weirdo' in the Northwest." He served as the editor of the campus newspaper, 'The Cooper Point Journal', for which he also wrote articles and drew cartoons. He befriended fellow cartoonist Lynda Barry after discovering that she had written a fan letter to Joseph Heller, one of Groening's favorite authors, and had received a reply. Groening has credited Barry with being "probably [his] biggest inspiration." He has also cited the Disney animated film 'One Hundred and One Dalmatians' as what got him interested in cartoons, as well as 'Peanuts' and its creator Charles M. Schulz as inspirations. In 1977, at the age of 23, Groening moved to Los Angeles to become a writer. He went through what he described as "a series of lousy jobs," including being an extra in the television movie 'When Every Day Was The Fourth Of July', bussing tables, washing dishes at a nursing home, landscaping in a sewage treatment plant and chauffeuring and ghost-writing for a retired Western director!